Dubai: Australia recorded a clean 5-0 sweep over Pakistan by winning the fifth and final match of the series by 20 runs at the Dubai International Stadium. A fighting century from Pakistan’s in-form batsman, Haris Sohail, who cracked 130 runs off 129 balls with 11 boundaries and three sixes, could not take his team past Australia’s mammoth total of 327 for 7 in 50 overs. For Australia opener Usman Khawaja, skipper Aaron Finch, Shaun Marsh and Glenn Maxwell hit half centuries to give them the big total. Pakistan were restricted to 307 for 7, although opener Shan Masood hit 50 runs off 54 balls and Umar Akmal chipped in with a run-a-ball 43 runs. Skipper Imad Wasim remained unconquered on 50 off 34 balls to produce a spirited chase and even take his team past the 300-run mark. 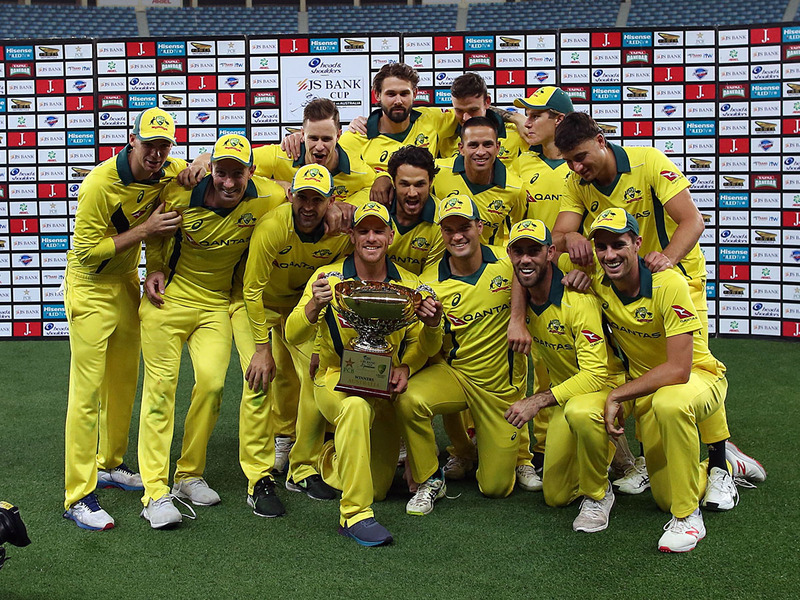 Australian marched off the field after winning all five matches of this series — to make it eight victories in a row, following their three successive victories in the last three matches of their five match series in India. They had clean-swept five-match ODI series on four ocassions before — against New Zealand (2005), West Indies (2008) , Pakistan (2010) and West Indies (2012). Khawaja cracked 98 runs off 111 balls with ten boundaries while Finch scored 53 runs off 69 balls with two boundaries and two sixes. They set the stage for the huge score through a 134-run opening partnership in 23.2 overs. Khawaja and Shaun Marsh then added another 80 runs for the second wicket. Marsh went on to score 61 runs off 68 balls with five boundaries and a six. This was followed by a breezy knock from Glenn Maxwell, who was playing in his 100th ODI match. Maxwell thrashed the Pakistan bowling to all corners of the field to score 70 runs off just 32 balls with 10 boundaries and three sixes. Walking in to bat at Australian on 214 for 2, Maxwell accelerated the run rate. In the last ten overs, Australia scored 107 runs to swell the total. Pakistan skipper Imad Wasim, leading the team for the second time as Shoaib Malek remained in the injured list, won the toss and elected to field. Chasing the Australian total, Pakistan lost Abid Ali, who cracked a centu-ry on debut in the last match, fell to the third ball of the first over for a duck. Jason Behrendorff, who replaced Nathan Coulter-Nile in the play-ing eleven had Ali caught behind. Haris Sohail reached his half century in 46 balls while opener Shan Masood hit his maiden half century off 52 balls. The pair put on 108 runs for the second wicket off 18.2 overs when Adam Zampa trapped Masood leg before two balls after completing his half century. Last match century maker Mohammad Rizwan lasted only 13 balls to score 12 runs before Maxwell got him caught at mid-off by Nathan Lyon. Sohail reached his second ODI century off 103 balls following his maiden ton in the first match of the series. Umar Akmal provided good support to Sohail and the pair put on a 102 runs partnership in 16.1 overs before Lyon had Akmal lifting to Behren-dorff at long on for 43. In the last ten overs, Pakistan needed 89 runs when Sohail too fell slicing a Kane Richardson delivery into the hands of Lyon for 130 and that put an end to the chase. Earlier, Khawaja and Finch began by stroking smoothly as always they have done in this series. The pair registered their 50 runs partnership in 6.3 overs with Finch lifting Abbas over long on for the first six of the match. Khawaja reached his 10th ODI half century in 48 balls. The pair put on their second 100 runs partnership of the series in 17.1 overs. Finch scored his 21st half century in 61 balls. Usman Shinwari provided the breakthrough by clean bowling Finch with a ball that came in and hit the pad and the wicket. Next man Shaun Marsh began stroking comfortably and Australia went past the 150 run mark in the 28th over. The two left-handers picked the gaps well and kept the score board moving at a brisk pace. Marsh record-ed his 15th half century in 53 balls. Unfortunately, Khawaja missed his century by two runs when he played Shinwari into the hands of Yasir Shah at mid-wicket. He had added 80 runs for the second wicket with Marsh. By the 40th over, Australia reached 220 for 2. Glenn Maxwell joined Marsh and hit Shah for three boundaries in the 41st over. He hit Junaid Khan for a six and a boundary in the 44th over and also lifted Abbas for another six over long on with enormous power. Marsh’s knock of 61 ended when Junaid Khan had him brilliantly caught by Abid Ali, who sprinted to his left and dived full length to complete the catch. Maxwell reached his 19th ODI half century in just 26 balls. Australia bt Pakistan by 20 runs. Australia 327 for 7 in 50 overs (Usman Khawaja 98, Aaron Finch 53, Shaun Marsh 61, Glenn Maxwell 70, Junaid Khan 3 for 73, Usman Shinwari 4 for 49). Pakistan 307 for 7 in 50 overs (Shan Masood 50, Haris Sohail 130, Umar Akmal 43, Imad Wasim 50n.o, Jason Behrendorff 3 for 63) .